After finding an autobiographical manuscript among her mother’s papers when she died, Ruth I Johns has expanded it with pedigrees, genealogical notes on the extended family, plus photos . 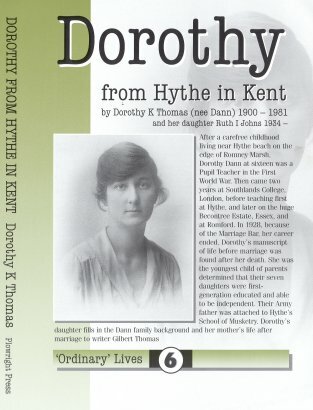 . . Dorothy Dann grew up in Hythe and trained as a teacher during the First World War, following which she had a successful and satisfying career. Her account of education in the early 20th Century is a fascinating social document. The first section of the book comprises details of family members, family trees and details of their lives and careers. Dorothy’s father was a long-service army man, holding a senior position at the Musketry School, and subsequently became steward of the renamed Small Arms School officers’ mess. This sets the scene in part two for the autobiography of Dorothy and brings to life a picture of Hythe at the time of the First World War. Her childhood days by comparison with today were carefree, with her closely watching the lives of the local fishermen and their dedication to the sea by serving as crew in the lifeboat. On marrying Gilbert Thomas, a writer, she was forced to give up her job, both by the rules of education authorities, which then forbade married teachers, and the social constraints of middle-class attitudes . . . In her 70s, she returned to the classroom as an assistant, helping children to read. Ruth Johns fills in the story of her mother’s marriage (significantly, the memoirs covered only her working life) and the tensions produced by her wasted and frustrated intelligence – the lot of so many bright women in the past. During the war as a teenager, Dorothy became aware of the privations endured by the civilian population and the sad story of the soldiers going to the front, never to return. Her choice of career was to become a teacher, starting as a now non-existent pupil teacher and proceeding to teacher training college in Battersea . . . This publication is full of memories of times past, generously supported by a wealth of photographs, including a page of ‘Polyphotos’. The book offers a compelling view of life during much of the 20th century in various parts of the United Kingdom and of a zestful and loving woman. It is a very interesting biography, with a mixture of family, local and social history, combined with the history of education. Stuart Bremner, College Archives, Southlands College, Roehampton University.